Last July, Microsoft launched the Upgrade Your World initiative as part of the global release of Windows 10, donating $10 million and more than $10 million in technology to 110 nonprofit organizations around the world including Save the Children, Malala Fund, Keep a Child Alive, Code.org, Global Citizen, Special Olympics, CARE, Pencils of Promise and The Nature Conservancy. Upgrade Your World resulted from Microsoft’s position that technology can be a strong force to drive impact, and that through technology, nonprofits have the ability to increase productivity, boost effectiveness through communication and better collaboration, and extend services to communities and individuals in need. The year-long initiative celebrated those who inspire and empower others, helping people achieve more through technology and in celebration of the Windows 10 launch. Participating nonprofit organizations continued their work to address important issues like maternal health in remote communities, to provide assistive technology, to connect HIV advocates and much more. For example, in Bihar, India, 42 percent of children younger than 5 are underweight. Upgrade Your World partner CARE is using technology to help meet maternal, newborn and child health needs through use of a mobile app that helps community health workers register pregnant women, mothers and newborns, and record real‐time healthcare information to improve health outcomes (see photo above). The app empowers the health workers to track appropriate and timely services through pregnancy, delivery and postnatal care. “The Upgrade Your World partnership brought products and licensing vital to CARE’s global operations, which support programs that directly impacted 65 million people in 95 countries last year,” said Joan Lundgren, deputy director of strategic partnerships, CARE. As part of the Upgrade Your World initiative, Microsoft and Special Olympics International also teamed up, providing new tools and technologies to enable athletes to train harder, track performance, share successes and receive encouragement with every step they take. Integrating technology into Special Olympics’ operations has transformed the way athletes celebrate results. As Special Olympics’ Official Technology Partner, Microsoft provided more than 2,000 devices for the 2015 Summer World Games in Los Angeles, and supported the development of the Games Management System (GMS) to, for the first time at a major event, track athletes’ personal bests in real time. 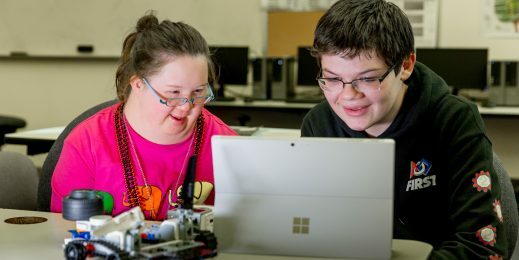 With Windows 10 Upgrade Your World support, Special Olympics also created Play Unified experiences across the United States, joining those with and without intellectual disabilities on the same team to inspire understanding and beat intolerance. “Special Olympics is always looking for new, creative ways to engage people who have yet to experience Special Olympics and have the chance to be a part of something bigger than themselves; this is where Windows stepped in to help us achieve our goal of creating a more inclusive world for everyone,” said Kirsten Seckler, chief marketing officer, Special Olympics. In the U.S., Team Gleason is making a difference for those living with ALS. Team Gleason was supported through the Upgrade Your World initiative in holding a unique talk at SxSW in Austin, Texas, to draw attention to ALS and technology that is being used as a tool to help those fighting the disease. Steve Gleason – former NFL player, ALS fighter and dedicated father – have been working closely with Microsoft over the last few years to collaborate and build technology that helps people with ALS communicate with friends and loved ones. “For two years I had been challenging tech companies, engineers and innovative leaders to help advance assistive communication devices. Microsoft was the only company who stepped forward and was eager to deeply understand the needs of those who utilize technology as an extension of themselves. The company committed time, money and talent to not only enhance the Surface Pro beyond its expectations, but went above and beyond to integrate controls for my power chair, allowing me to regain much more independence. The process has been as exciting as it has been liberating,” said Gleason. Another Upgrade Your World partner, Keep a Child Alive (KCA) furthered their mission to combat the physical, social and economic impacts of HIV, particularly hard hit communities in Africa. As part of the partnership, KCA strengthened its youth-centric services at the Victor’s Club in Kampala, Uganda, as well as the Youth Zone in Mombasa, by integrating technology into programs to create a global network of young advocates to exchange stories, find support and empower each other. “It’s inspirational and amazing to see how our nonprofit partners use the power of our technology and marketing to help realize their missions,” said Mary Snapp, corporate vice president, Microsoft Philanthropies. While the year-long initiative comes to a close, the work doesn’t stop here. Microsoft’s mission is to empower every person and organization to achieve more. And Upgrade Your World is just one example of the many ways the company is empowering local communities worldwide, as Microsoft and its employees donate more than $1 billion each year to more than 100,000 nonprofit organizations around the world. To learn more, visit Microsoft.com/philanthropies and Upgrade Your World.